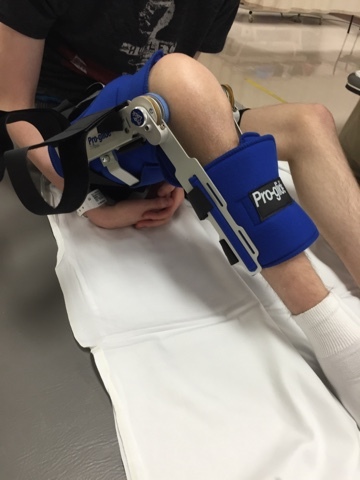 Robbie has a knee contracture preventing him from straightening his leg. The picture shows his leg as straight as it currently will allow. His tendons are too short & tight and also due to scar tissue…all from his leg surgery in December. He has had months of physical therapy with very little change in his leg. Dr Lin plans to do surgery on his leg this week if his schedule is open. He will start with cutting, nicking, and stretching Robbie’s tendons. If that doesn’t help, Dr Lin will need to perform a more invasive and risky procedure to scrap away scar tissue from his prosthetic leg. There is a greater risk for infection and risk for nicking major arteries in his leg. Also a much longer recovery. We are hoping the first procedure works. Dr Lin will decide during surgery if he needs to do both, so we won’t know until after surgery. Dr Lin hopes to give Robbie’s leg greater range of motion allowing him to eventually walk again. Currently he has little use of his right leg and has limited mobility. He is also having other complications with his leg. He still doesn’t have feeling in a majority of his right leg and has limited movement of his foot. Even with all the complications, his doctors are pleased with his leg and said just a few years ago, he would have lost his leg. The type of surgery they used is a more recent procedure to avoid amputation. He will need to continue physical therapy, but we are hoping to transfer back to Oklahoma sometime in June depending on how he is doing.